I have a large wooden cutting board which is used in my kitchen mainly for preparing egg pasta. The wood type is Populus (poplar or aspen or cottonwood). The main ingredients used with the cutting board are: flour (mainly soft wheat flour), hens' eggs, white sugar, butter, and baking powder. After the food preparation, the cutting board is cleaned by scraping away the ingredients remains. The board has some cracks and some small unknown insects are living inside the cracks. The board has also a lot of holes due to woodboring beetles but I think the woodworms operated long time ago and they no longer live in the cutting board. The unknown insect has an approximate length of 1 mm (along the direction of their movements) and a width of 0.3 mm. The unknown insects do not have wings, they just walk. I am not able to see how many pairs of legs they have. The color of the insect is pale brown. The cutting board was free from these unknown insects some months ago but then they appeared. Are these insects poisonous to humans? The unknown insects could be Acarus siro, I will try to get a picture of the insects. Here is a picture. The bottom part of the image is a one Euro coin, the top part of the image is a caliper (each bright area is one mm tick). 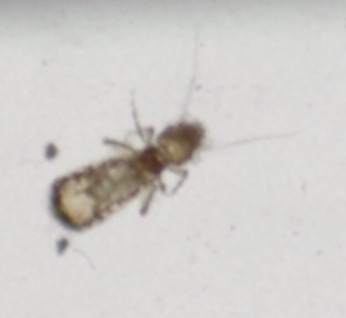 This is a species of psocid (of the family Psocoptera, AKA booklice). Species are best differentiated by their abdominal structure and antennae. Without a better (more magnified) image and info about the OP's location, identification to species is not possible. Though its small size will definitely narrow the options. If I had to guess based on the limited detail (and my limited knowledge), I'd say it's a species in the genus Liposcelis or related genera. See Oklahoma State's ENTOPLP ID key for examples and info. I've included 2 random images of Liposcelis species for reference: the (TOP) is Liposcelis brunnea and (BOTTOM) is Liposcelis corrodens. You can find info about prevention and removal from Oklahoma state, King's College London or the Orkin man. 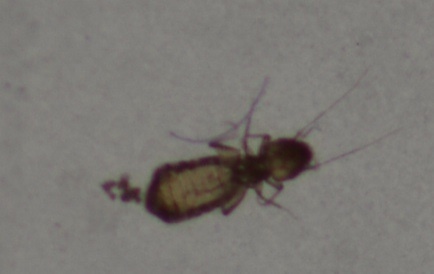 UPDATE: Though I, myself, cannot identify this psocid to species, according to this KCL article, Liposcelis bostrychophila is the most likely candidate. [See here for ID notes]. Liposcelis bostrychophila is the principal psocid pest species in the UK and in Europe. This single species, which is mainly an inhabitant of households, is responsible for virtually all of the psocid related complaints in the UK (Turner & Ali 1996)...Recent estimates are that 30% of households contain this species. Several other small (about 1mm long), flattened, wingless liposcelid species (eg. Liposcelis corrodens, L. pearmani and L. brunnea) can become quite common in industrial sites, particularly in the summer months but are uncommon in domestic premises. Not the answer you're looking for? Browse other questions tagged species-identification zoology entomology food pest-control or ask your own question. 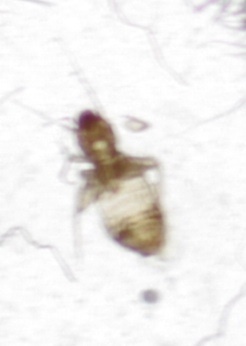 Is this bedbug or book louse? Is this a bed bug or some other bug? Insect identification - Is this a bedbug? 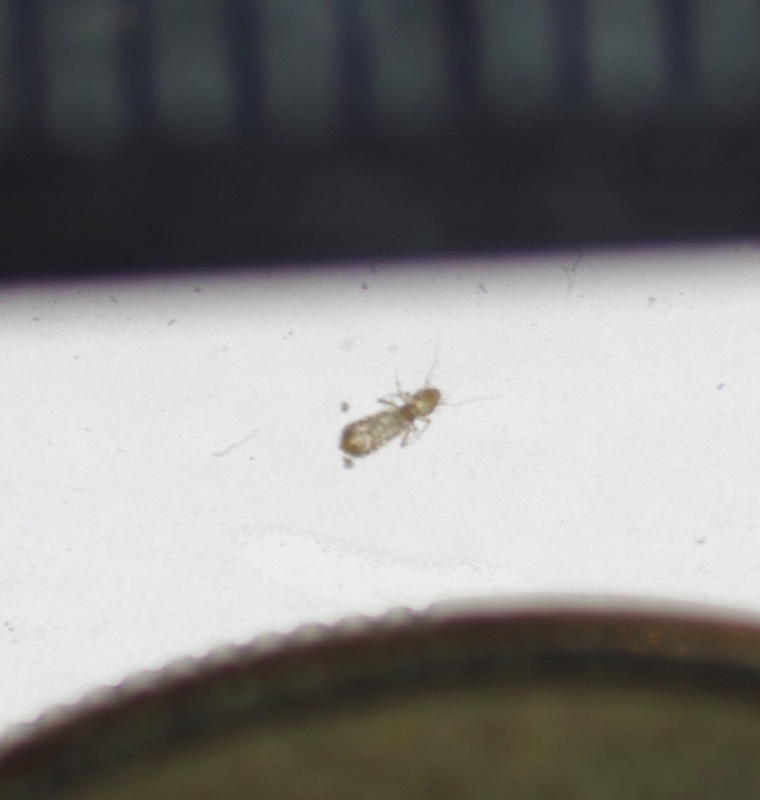 Species Identification - small insect: is this a bed bug? How to calculate the number of sterile insects that must be released in SIT? What are these Bahrain insects living in a colony?